It would seem that those who conceptualised and built the Game.com had a very different market in mind as a user base than those eventually targeted by its bizarrely insulting marketing strategy and, indeed, by those responsible for 95% of its commercial software releases. With Nintendo’s DS still several years away, nobody had yet proven the untapped sales potential of a market of grey haired casual gamers, more interested in sedate, puzzle solving than fragging and fatalities. As such, only a handful of early titles are left as clues to the direction that Tiger’s handheld probably should have taken, instead of taking a sharp left turn to DukeNukem-ville. ​The Game Com port is a bare bones iteration of what is already a minimalist experience but it was a wise choice to show off the, then groundbreaking, touch screen stylus controls. We’re not going to waste time reviewing the gameplay and rules of Solitaire, given that everyone and their aunt has surely played it by now. Instead let’s talk about how the Game Com version plays. There are no bells and whistles and barely any sound effects, you touch a card to select it and then touch the place in the deck you want to place it. There is no dragging involved, just a simple touch based interface. 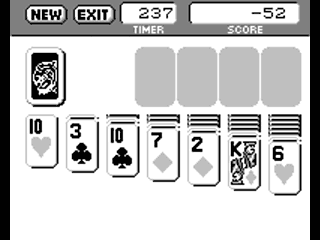 The limited display of the Game Com’s screen does mean that with larger stacks you have to cycle through the cards to see what is under each card, rather than having them displayed in overlapping fashion, which can be a little clunky. Additionally the top pack only deals one new card at a time as opposed to the traditional three you would see on PC versions. Oddly, upon placement of your first Ace, a 250 second timer activates and then…just sits there, never counting down or moving. It’s quite an odd thing. Despite trying all kinds of button presses and stylus touching, we’ve never found a way to activate it and can only conclude it is an unfinished feature. If your game is successful and you clear all of the cards then your score will be saved on the Game Com’s built in high-score table. If you reach the point of no-return then you can use the menu button to activate a new game. And that’s it really. If you like solitaire then this is a functional free version that plays exactly the same game of cards as most other versions. Some customization and options would have been nice but as well as being a good example of the direction Tiger should probably have maintained with its software, it’s also an early indicator of the minimal effort they were prepared to put into their actual games.